What’s driving industry cloud migration? The pace of cloud adoption is speeding up and businesses have an increasingly sophisticated view of the cloud’s benefits. But what issues are driving companies down the path to value? Which of the following are most affecting your business today? Select up to three. Click to enlarge. As you can see in the chart of our total respondents, technology change is a top factor affecting businesses today. This is especially pronounced in government/education, retail, and financial services firms—48% of respondents from those industries said technology change is the top factor affecting their industries. Legislative changes like the Affordable Care Act are having a pronounced effect on the healthcare industry—47% of respondents from that industry said increasing regulatory requirements were affecting their businesses, followed closely by economic uncertainty at 45%. 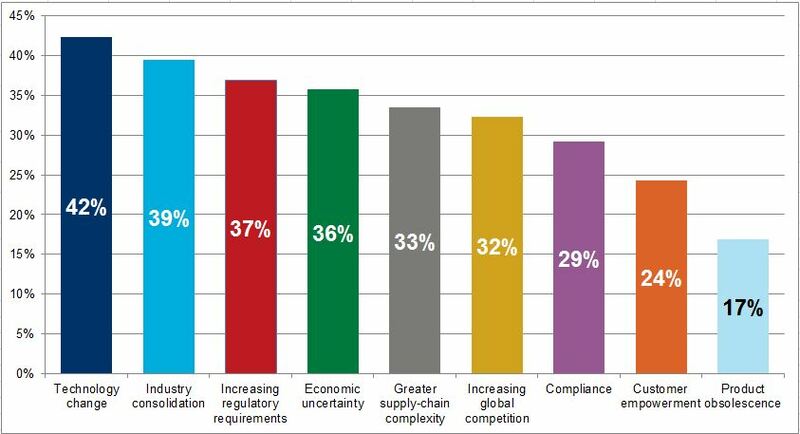 Professional services firms are an outlier—the top factors affecting that industry are greater supply chain complexity (39%) and economic uncertainty and economic uncertainty (36% each). Product obsolescence is also significantly affecting more professional services businesses—28% vs. 17% of the total respondent pool. This entry was posted in Research and Reports and tagged adoption, cloud, industry by Ben Wright. Bookmark the permalink.